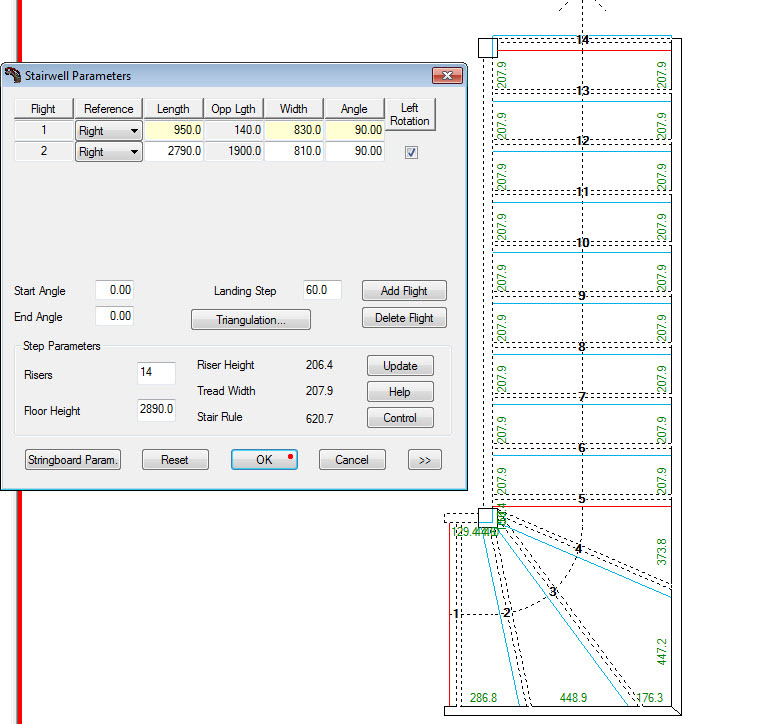 HomeWood Designer ForumStairDesignerPlease create files for stair. Please create files for stair. You could build in 2 parts, install the upper flight and then the quarter turn. In your project, only the right string needs to be in 3 parts. Is it a good idea to build in 2 pieces? the old stair is in 2 pieces? This because of the overall weight? What do you think? is this something to think about? and is this possible? Don’t forget to edit the riser housings around the newel. Then take the sds that u drawed with the 15 steps. The adjustment of the 5th step will make the winders wider and therefore safer. 1- the upper flight steps become narrower. These steps were already too narrow, they now become even more dangerous as they are narrower than the rise. 2- in descent, the transition from the narrow second flight steps to the wider goings on the winders is now very marked. In descent, this makes tripping on the 5-4 steps much more likely. This is not factual data and these points are debatable. Stair safety and compromise outside building regs is on a sliding scale, where changing certain parameters slide the stair into a more or less safe configuration. It’s however certain that your will be sliding into less safe ground. Could you post your sds file? I have just move step 5 a little to out of the spil, i now each step is a little smaler but thats ok. It is ok like this then. 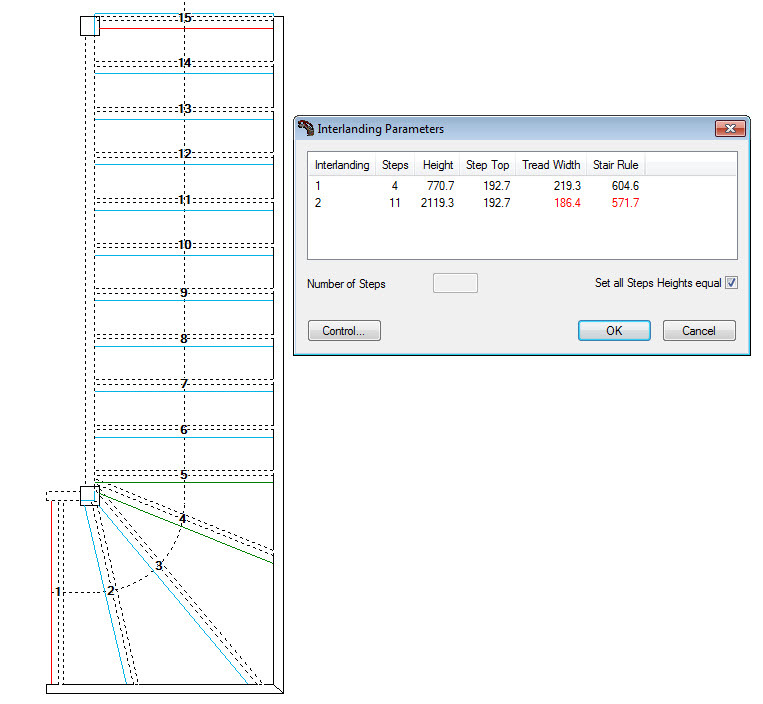 Here is the sds file and the pdf workshop documents of the stair with 15 steps. Can you verify carefully and confirm that this is the model you want to process for the working documents? Once validated I’ll send you the working files. Please be careful because once processed any modifications that require a new set of working documents will require buying another StairFile. Hi, the customer had now 16 en want to go to 15. So take the 15 steps please. Thx for the explanation. Your customer is wrong to look only at step heights. Stairs for tight spaces are always a question of compromise. But when advising customers it’s important to emphasize that the most important point in a steep stair are the step widths, not the heights. The safer stair is the one with the wider step. When climbing a stair the effort required is determined by the stair height. This effort is distributed in time according to the stair angle. 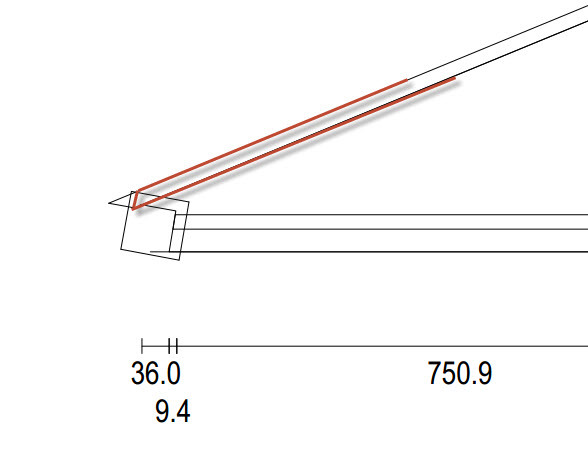 This determines the cimb effort of the stair, the steeper the angle more climb effort. 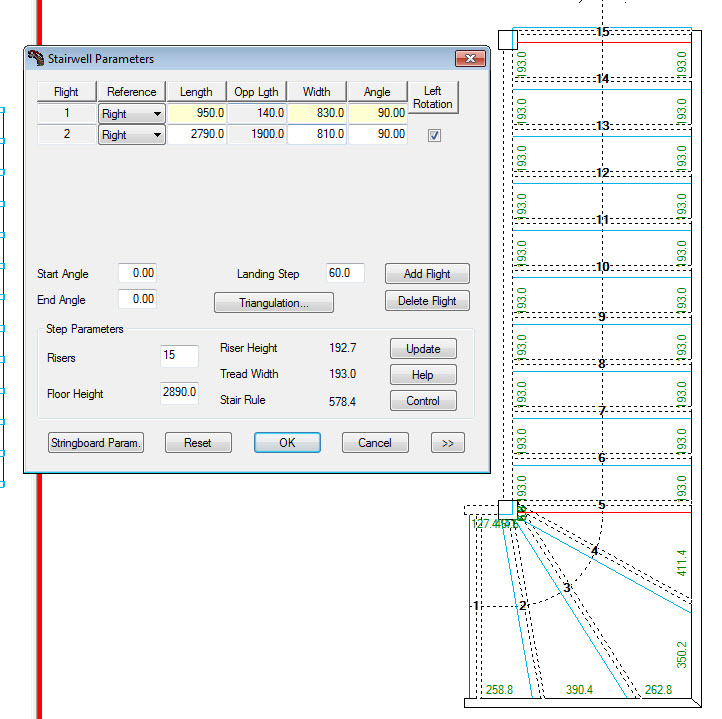 This angle is determined by the length of the tread line and the total height. If this is the same for 2 stairs the angle is the same and the total climb effort is the same. However, when it’s impossible to get within the stair rule values because of lack of space, the stair becomes dangerous. The danger in a stair comes from the foot room when you are descending and not from the step height. When climbing the step width is increased by the nosing overlap and the steepness or angle of the stair doesn’t make it dangerous. Think of using a ladder (a very steep stair) , climbing might be tiring but the risk of falling is minimal. However think of going down a ladder front first, the risk of falling becomes enormous! 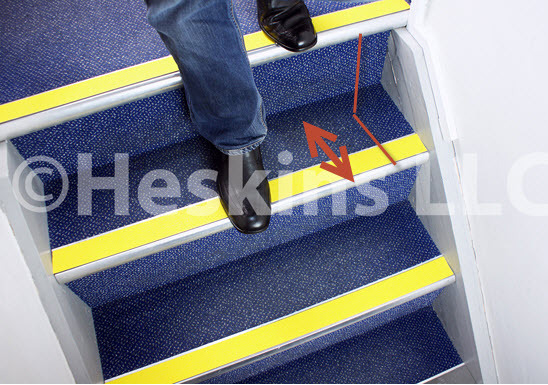 Increasing the number of steps to 15 reduces the step height but also reduces the step width and reduces the stair rule value to 578. This makes for a dangerous stair when descending. I can send you the files to build the stair that you choose, but I strongly suggest that you try to explain to your customer the real objectives of stair design before you make your decision. I don’t know what the situation is like in Belgium, but here in France if a stair doesn’t comply to the building regs and there is an accident, insurance companies can sue the stair installer. In France stair accidents are the main domestic accident but risk can be greatly reduced by following the principles explained above. Hi Jonathan, just a quick message to say Ness is away doing on site training today. He’ll reply following that. The old stair has 16 steps, so the customer is ok with 15 but 14 is to high to him! If its al ok then, i want to let de files print friday or saterday please. Here my answers from the customer. PS, i can not download from the site anymore? in differrent browsers not? I’ve checked your stair and made a few tweaks that I would consider interesting if you don’t have any objections. 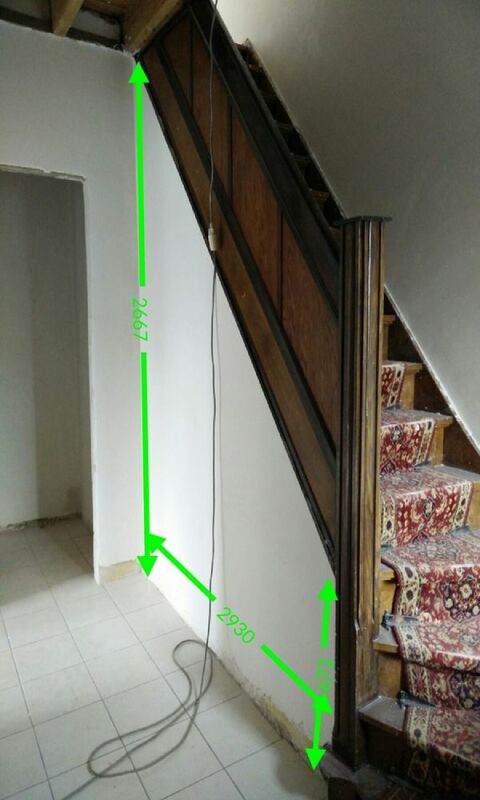 Is the stair is a replacement of the existing stair in the photo? YES, ther under is a stair to the basement. adjusted the winders so that the step and riser housings are not over lapping the string to post assembly. Of course if you have specific reasons against these modification you can change back. Is the stair is a replacement of the existing stair in the photo? 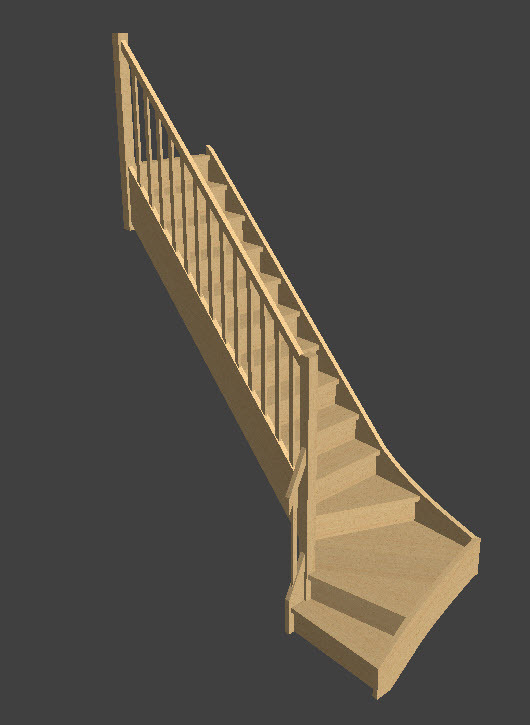 I have upload a file with size of the old stair, can you please check if its possible to this sizes? Can i buy this in PayPal direct to your PayPal account please? I just need the full size files for printing. Is a stairfile light good then?